A Fire Telephone System ensures communication between fire marshalls, control rooms and the fire department (when on site), as well as disabled persons and those trapped as a result of a fire. It has to comply with the Standards so a basic intercom is not an acceptable alternative, even when mounted in a “red box”. 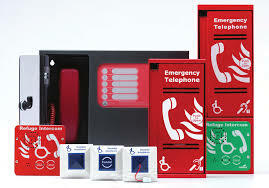 TOA Electronics Southern Africa (PTY) Ltd, proud distributors of VoCALL Fire Telephone and Disabled Refuge Systems have increased stockholding of VoCALL Fire Telephones and Refuge Systems to keep up with demand.